How does an asteroid capture a moon? 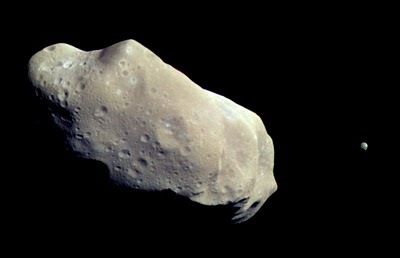 Back in 1993, Galileo snapped pictures of the asteroid 243 Ida as it passed on the way to Jupiter. The pictures revealed a tiny moon, Dactyl, orbiting about 90 kilometers away. The moon is made of rocks with a similar composition as Ida. Image from NASA and the Galileo spacecraft. Since that initial discovery, astronomers discovered about 200 asteroids that are binaries. They even found one that is a triple. In May 2013, radar imaged 1998-QE2 and found a tiny moon orbiting the near earth asteroid. The tiny moon is about 600 meters long and orbits a 2.7 kilometer asteroid in less than four hours. I used Gimp 2 to assemble the radar images, taken over a little more than two hours, into an animated gif. The white object is the asteroid moon and the rotating body is the asteroid. Original images from NASA/ JPL-Caltech/ GSSR. It is impossible for Ida to capture passing Dactyl, according to the rules of gravity. The Sun’s pull on Dactyl is about four times as strong as Ida’s at its orbital distance (~90 km). At this distance the escape velocity is ~9.3 meters / second. The capture window for Ida is extremely narrow. The moon must approach at a relative speed not to exceed the escape velocity at each position of its approach. If it comes in too fast, it will swing past the asteroid. If it approaches very slowly, it will spend so long in its approach that Ida will accelerate it enough to exceed escape velocity. Even if Dactyl collided with Ida and bounced off or it was affected by the gravity of a third body, capture (according to the laws of gravity) is impossible. Yet we observe more than two hundred asteroids with moons. The Bible can give simple answers to complex issues. It mentions the shattering of a nearby planet in Isaiah 51:9; Job 9:13; Psalm 89:10-11; Job 26:11-12. How do we know these refer to a planet smashing? All societies 3500 years ago told stories of close planet passages and the crushing of a nearby planet. The biblical passages use similar descriptive language as the Canaanites used to describe the shattering of one of their planet-gods. Yet the Bible denies that the planets are gods and forbids their worship. In Hebrew, the planet Rahab is not spelled the same as the woman Rahab. If a planet was shattered in a collision, rocks that were adjacent to each other before the collision would likely be traveling at the same speed and almost the same direction as they moved away from the shattering impact. Under such initial conditions, capturing a moon or forming binary asteroids would likely happen often. Is it significant the moonlet Dactyl is has a similar composition as its partner Ida? Is it worthy of consideration that asteroids and comets have rocks that on Earth formed deep underground under volcanic conditions? Is it significant that they contain rocks, like cubanite, that only form in warm, liquid water? Today those bodies much colder than the melting point of ice. Why do asteroids and comets often have shapes like peanuts, dog bones or potatoes? Why do they contain long cliffs and faults and even square craters? Why do asteroids and comets sometimes have flat bottomed craters and concentric rings around dust ponds? Why does dog bone-shaped Itokawa have different compositions on one end than the other? The answer is simple. Our ancestors a few thousand years ago saw the shattering of a nearby planet. The pagans imagined that planet gods were engaged in a great war. If a watery planet was shattered, each major piece would have a vapor trail, which the seafaring Canaanites would imagine was a multi-headed sea serpent. The Bible uses similar descriptive words as the Canaanites while condemning the worship of the planets as gods. The planets are not gods, yet at least one of them was shattered in a collision. If you do not understand how planets could have passed close to Earth 4,000 to 5,000 years ago, read about gravity aberration on this web site. Gravity aberration continues to push objects slowly outward, so that their orbits never quite close. The animated image of asteroid 1999-KW4 is from NASA’s JPL.